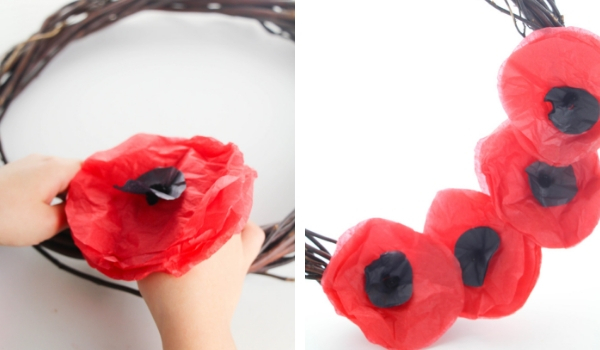 I’ve made tissue paper poppies with my daycare kids almost every year now. 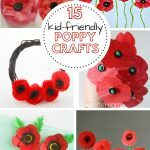 It’s a simple and straightforward craft that even the youngest of them can make, and the finished poppies can be used in so many different ways. 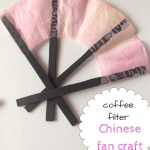 We’ve also painted coffee filters to use for this craft when I’ve been out of tissue paper and it works great. 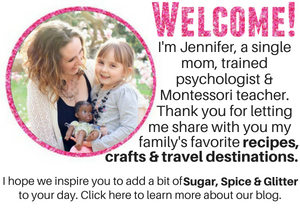 We can turn them into badges (safer than pins), poppy magnets, arrange a vase with some, add them to a picture frame, or – as my daughter shows – tuck them in our hair. 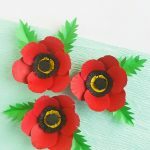 We stuck with the traditional red poppy, but poppies do come in a wide variety of colors so you could also mix it up with pink, purple, white, yellow and orange (there are no blue or green poppies in nature, apparently). The white poppy was traditionally the poppy worn during war time, and some pacifists prefer the white poppy to honor the fallen but also make a statement about war, but if you use white poppies you should know that some people have made it a contentious issue in recent years (so you may get some nasty comments). As a veteran’s daughter, I’d love to see those people spend their time advocating for veteran’s rights and benefits during the rest of the year rather than picking fights over Christmas displays and white poppies… but I digress. 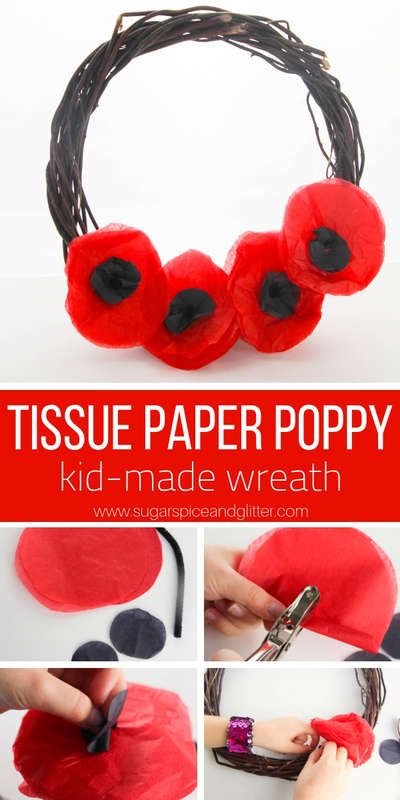 This simple poppy craft takes less than 10 minutes to make, from cutting out the circles to attaching the finished poppies to your wreath. 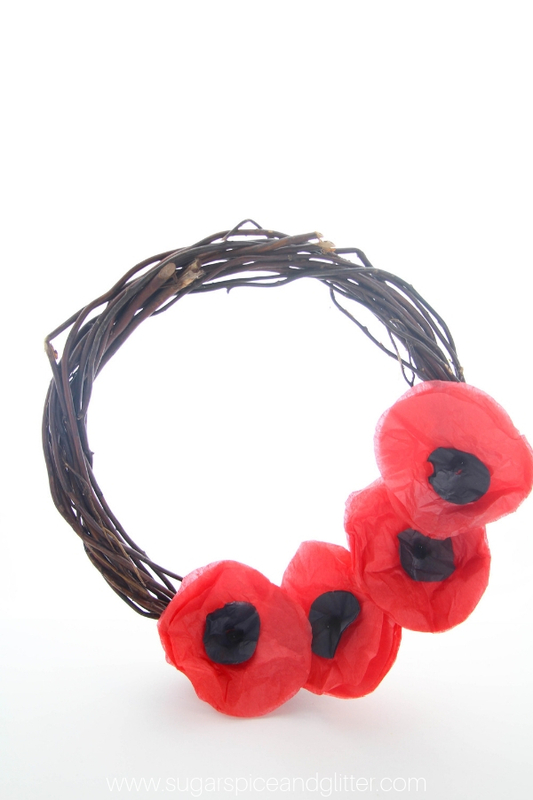 We chose not to attach the poppies with glue and just to wind the pipe cleaners around the wreath to hold them in place, because I’m not sure how the tissue paper poppies are going to hold up to a year in storage, but you could definitely use glue to attach them if you are concerned they will shift or fall off. 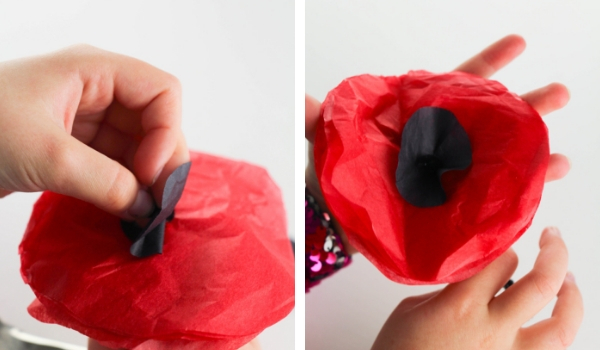 Tip: have glue on hand in case you have issues with your poppies shifting or falling off. 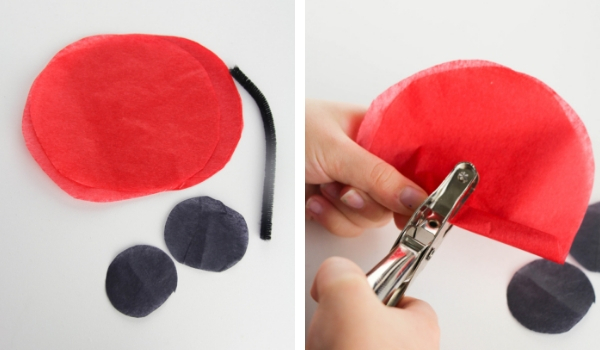 First, assemble your materials and cut your tissue paper circles. We did large red circles for the poppies and smaller black circles for the interior (carpel) area of the poppy. Older kids can do this independently, younger kids will need help. 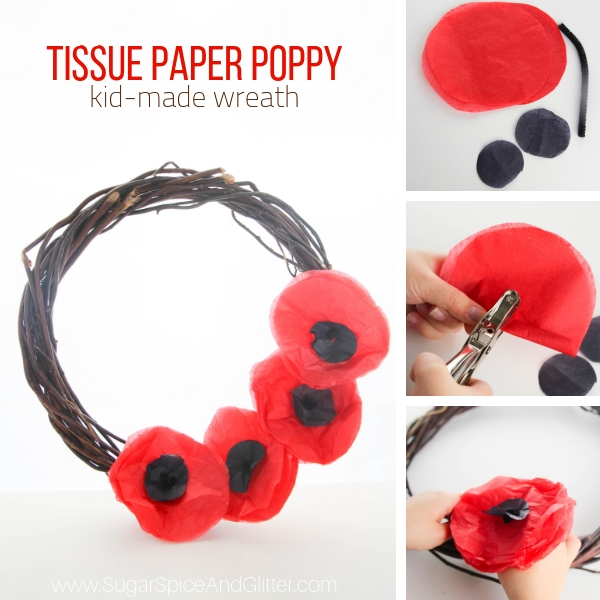 Using the pipe cleaner or your hole punch, poke a hole through the center of several layers of the poppy circles. We found 4-5 layers gave the poppies a nice, full look. Repeat with 2 small black circles. 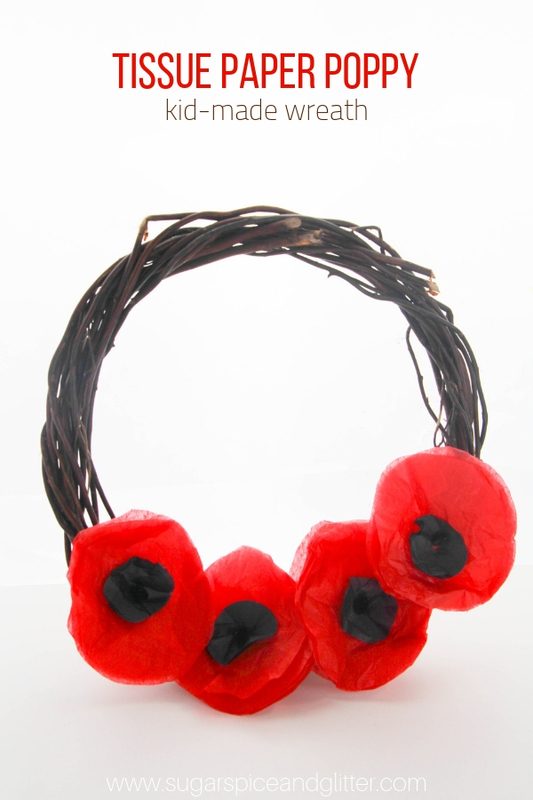 Poke the pipe cleaner through the poppy layers and then bend it down to secure in place. 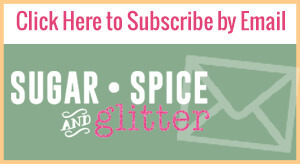 You may want to add a dab of glue at this point. 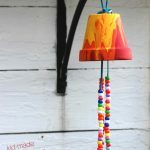 Scrunch up the poppies to give them a bit more dimension. Wind the pipe cleaner into the wreath to secure it. 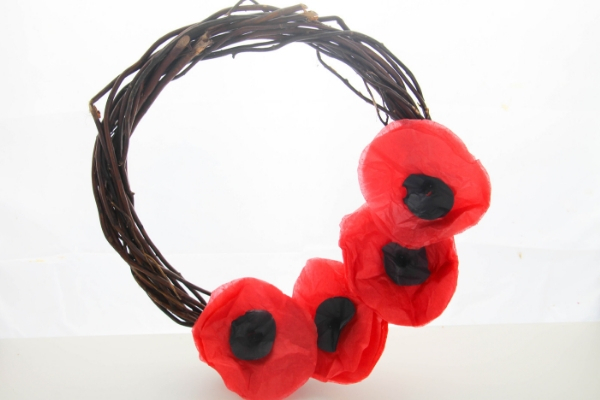 Repeat with remaining poppies until you have filled your poppy wreath to your preference. 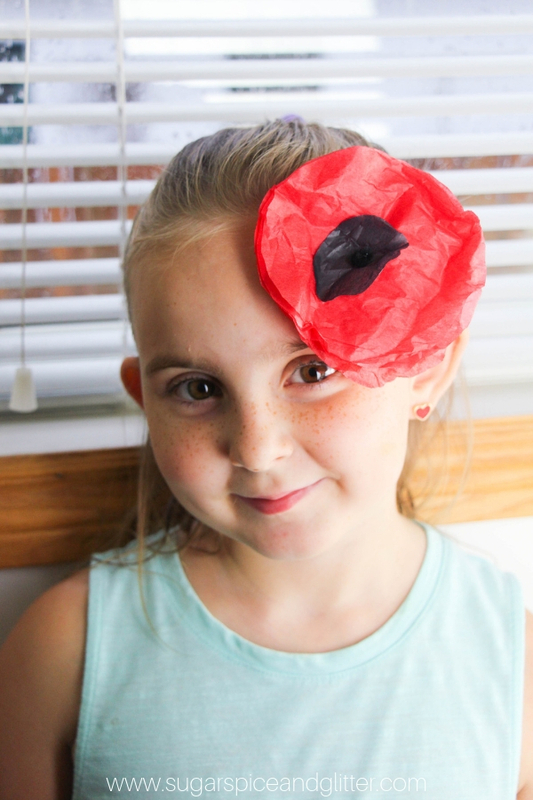 This simple tissue paper poppy wreath craft is perfect for discussing Remembrance Day or Veteran’s Day with kids and is simple enough to do with mixed age groups. 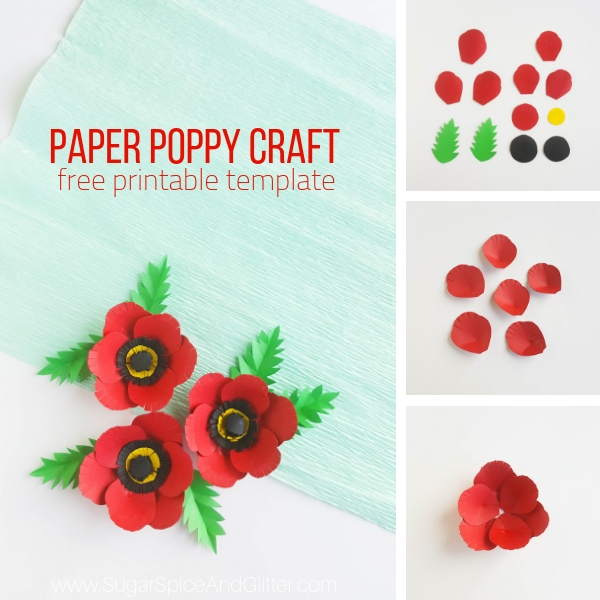 For more awesome poppy ideas, check out our Paper Poppy Craft (with free printable template) or our collection of 10 Poppy Crafts for Kids.